Rupert Knox-Johnson at Oyster Yachts confirms a £250,000 price drop on his listing for sale, the 25m sailing yacht Dama de Noche. 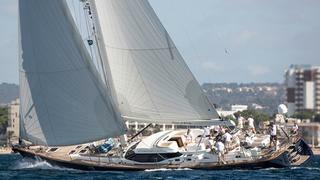 Built by British yard Oyster Yachts as an Oyster 82 model to a design by Rob Humphreys, she was delivered in 2008. Dama de Noche is cutter-rigged and features full hydraulic sail handling with in-mast furling and a superyacht cockpit second to none in this size range. The Oyster 82 offers versatile and surprisingly spacious living areas comparable to a much larger design. The upper saloon is window height, providing great views with a huge table and settee plus a large communications/computer area. Accommodation is for six guests in three cabins comprising a master, double and a twin. Although MCA compliant, she has never been chartered and has seen only private use by a meticulous owner and his family. Cruising grounds have primarily been the Mediterranean and Caribbean seas. Dama de Noche is now down from £2.75 million to £2.5 million with VAT paid.